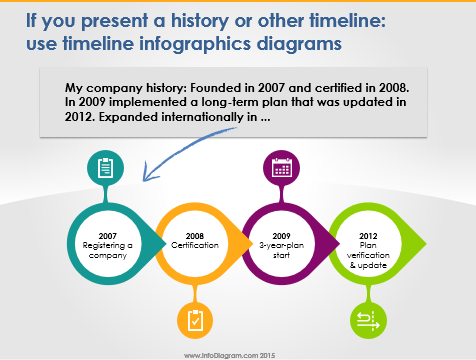 Do you have a presentation slide with some timeline or time sequence information? It can be a process description, a company history or a procedure explanation. Here are some examples of how you can change this text information in a visually attractive way. The simple trick is to separate time events from your text and put each one into a separate shape. Having a set of basic shapes in order, you can go on and add some illustrations – arrows, icons and graphical style to the shapes. So they create a nice compact simple infographics illustration. Just keep it consistent. Use 1-2 fonts, one icon style (e.g. modern flat symbols or hand drawn pictograms) and consistent color palette. You can create such shapes yourself from basic PowerPoint shapes. 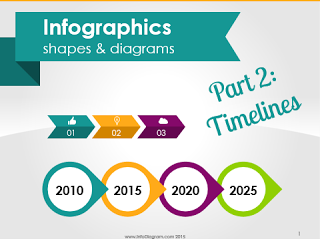 Or get the ready-to-use predesigned Infographics Diagrams PowerPoint Slide Set. PS. Let me know what’s your biggest challenge with presentations? Comment or write to me directly via the Contact page. I will be glad to share an advice.